You need to be precise with the number to train the race car optimally for the race! If you have a goal of moving the fastest in the race, then why are you moving slowly in the gym? Move to a lighter mass and start ramping up the recruitment, activation and movement speeds. If you have a goal of moving the most mass then yes, ramp that up but know you are training the diesel truck within you and not the Ferrari. You are becoming Milo of Croton. If your goal is a mixture of moving mass at a decent speed then you are dealing with power, which is the product of mass and velocity. For power training we typically work out with weights that are 30-45 percent of your maximum effort or one repetition max mass. This is the big block Chevy muscle car. And–yes–there may be a time and place to train with more mass even with a goal of speed. Most sport actions take place in fractions of a second. You have hundredths of a second to pick up, hone in, decide, and swing in softball. The takeoff foot may be on the ground for between a tenth and two tenths of a second when pitting that last plank on the long jump runway. The time parameter of the sports action dictates how you should train in the gym. For example, if you are training an athlete for speed and you know that .15 seconds is the amount of time it takes for the striking foot to complete the action of hitting and propelling off the ground, then the only exercises that will benefit or improve the speed component of your athlete need to be designed for around .15 seconds or less. You may be able to squat 500 pounds, and be built like a semi-truck, but if the CNS responds slowly when recruiting muscles, then that 500 pounds will not transfer meaningfully onto a quick sport athlete. For Milo, yes, but for the soccer goalie, no! If you are running repetitions in the gym at .5 or .6 seconds, then that will not transfer to sport with needs faster than .5 to .6 seconds—your body will not respond faster than it has been trained. If the time did not matter then the world strong man and woman competitors would also be the fastest, most agile, quickest, and most powerful simply because they are the strongest. They would have all Guinness records and Olympic gold medals to show. We need to get better at presenting a sport specific environment for our CNS to develop and adapt appropriately. We need to be better at tuning our race car for the actual race. Too often we train for a strength competition, but then expect to race like a Ferrari. It should come as no surprise then why we may fail, not improve, or not reach our potential. 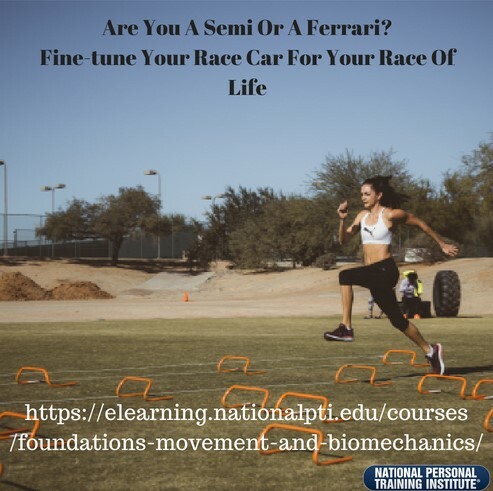 Check out our Foundations: Movement and Biomechanics – Build Your Race Car Course. We promise a fun and mind-blowing ride. By the end you will have a resounding advantage in guiding your clients to sustainability, success and performance beyond their wildest dreams.